I finally picked up a Halloween mug. When I first saw this at the store last week, I wasn't sure I liked it, so I left it there. I'm happy to say I went back tonight and bought it. Now that I'm drinking a hot chocolate out of it, I think it's just perfect. I love how the witch is flying behind a spider web. 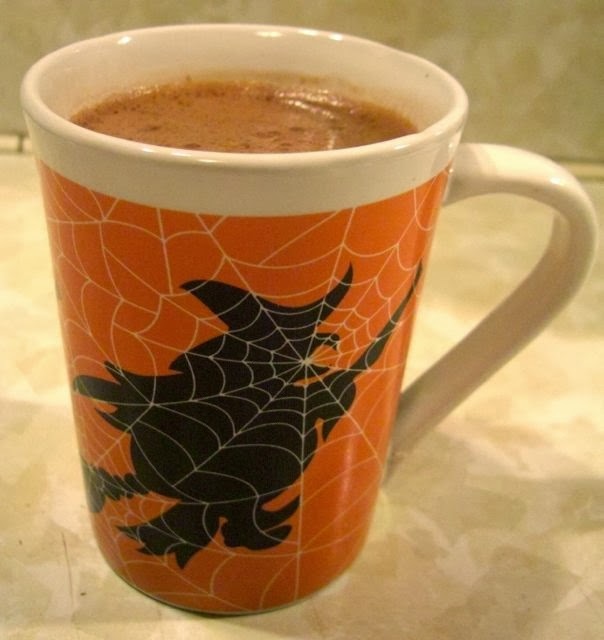 It's a Hallween mug that isn't kidding around. Really looking forward to using this mug for pumpkin spice lattes throughout October. I love your mug! Very seasonally appropriate! I LOVE it. So much fun. I grabbed some organic soy milks on clearance. Those shelf ones, I tell ya what, I loved it in my pumpkin latte. SOOO good. Before I was using almond milk, which I like better for baking than soy, but boy, was the soy great in the lattes. I had to stop using it years ago because it was mucking up Tim's belly after drinking so much. From at the bookstores, from time to time, he can drink it fine, so when I saw it clearanced, I gave it another go. We drink zero cow's milk in the house. Anyway, I like the organic soy (365 days, brand), over almond because it's got a fattier creamier texture and really holds to spices well. I should say, he was using the soy each morning in cereal and after awhile, it was gassin' up his belly. Now you can never un-know that. You are weclome. Then they shall also know that pumpkin spice lattes, made at home are the BEST.